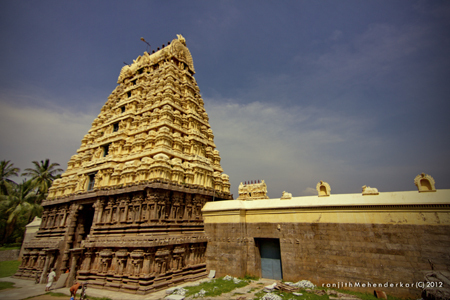 This temple is a hot spot of vellore city and which it was the temple is built at the centre of a tank. 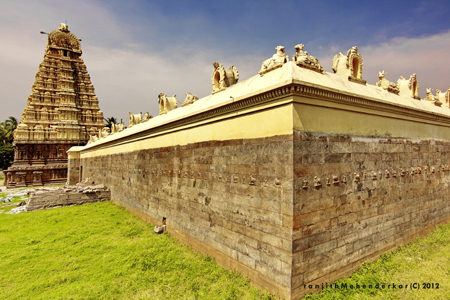 There is a beautiful water fencing (Agazhi) around the temple appearing as a garland. The circumference of this Agazhi is 8000 feet. The sculpture in the wedding hall of the temple has two faces in a single body, an elephant and the bull. Water for the abishek of the Lord is drawn from well which is very old. This is the Ganga Gouri holy theertham. The well has a natural spring in itself and not dug. There was an ant-hill (a sand mount made by white ants having many holes housing snakes inside called Pampu puttru in Tamil) in the place where the sanctum sanctorum of Jalakandeswarar exists now. Rain waters in the lower levels of the anthill made a tank there. There was also a Shivalinga under the water of the tank. Lord Shiva appeared in the dream of a chieftain Bommi Reddy who was ruling the region and asked him to build a temple there. The king went to the tank, demolished the ant-hill and took out the Shivalinga and installed the Lord in the water itself. As the Lord was installed in a place surrounded by Jalam (Water), He is named Jalakhandeswarar.